Education has become a “competitive business”. The investment on buildings are largely looked from the eye of ’lucre’. Sensitivity to the design of spaces for learning are not intentional; only accidental, if there is any. The governmental segments, on the otherhand is based on a welfare concept, and run by bureaucratic as well as political expediencies, exigencies and dogmas and has megre resources even for proper buildings. Investment in design is generally considered a wasted resource. Also most managements work on creating oppressive competetive environment for teaching for the examination. In this context, the occassional commission one get to design school comes with lots of strings, budgetary and other limitations and strifling regulations. One has to work with in this and around this environment to make sense out of a project. The project management and quality of construction is often constrained by incompetent and unsuitable models. We considered that the students and their spaces out side the class room is more important than the the confined spaces for specific functions. Interaction spaces- the staircase, the corridors etc.- make the school to linger on the development of spatial and environmental sensitivity, even if sublimanally, perhaps . 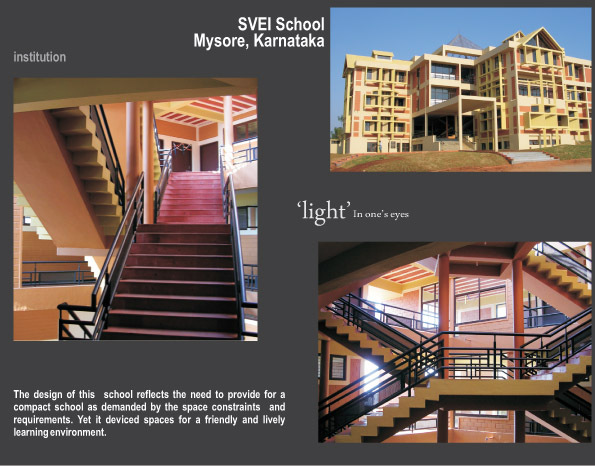 The SVEI school on the edge of Mysore city was designed this in mind; but the building programme is severely costrained by limited managerial vision on school environment and cash flow. There was limitation of available land as well. 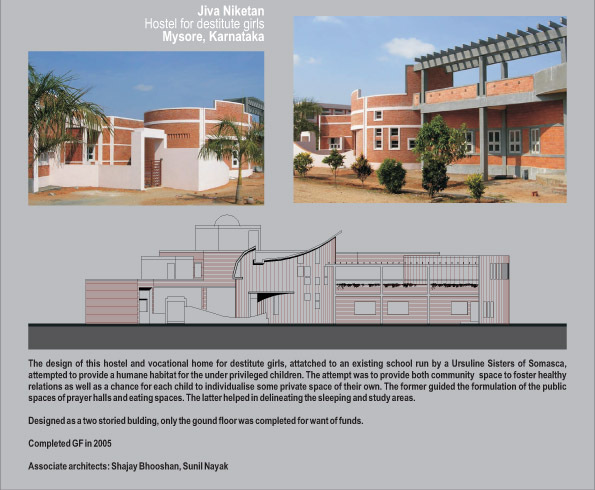 The design was developed for building in several stages spread over a long time. More land also got added. 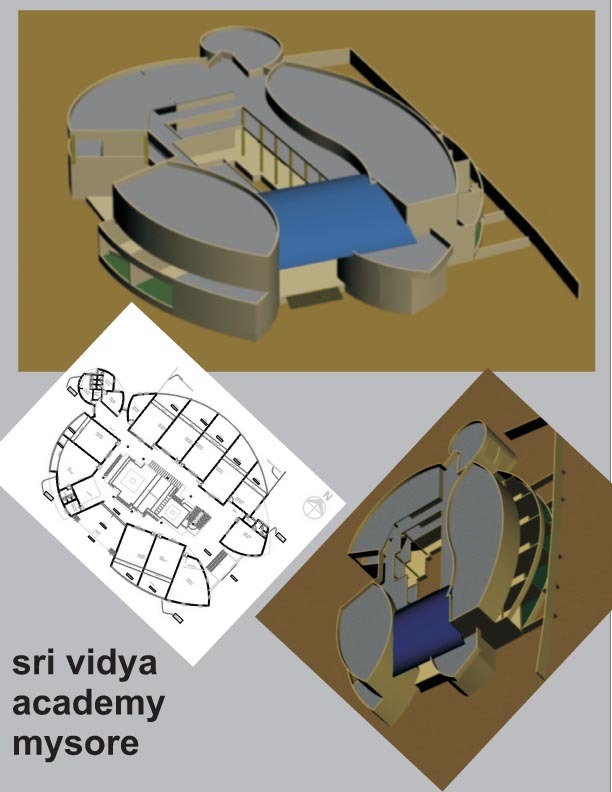 The stages were far apart in time that the design had to undergo mjor changes as the content of the academic programmes also went through massive changes as well as shifts in the paradigm. The architectural and spatial intent is somewhat surrepttiously incorporated into a more simple construction vicabulary and programme. 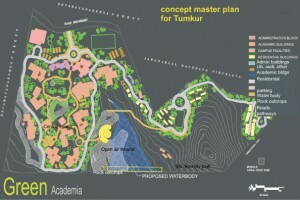 The site consists of 75 acres and 225 acres on either side of a highway inside a reserve forest about 20 km from Tumkur town where a regional university campus is to be established. Only 75 acres would be developed first , the other side reserved for future and for bio reserve experiments. The area is rocky and hilly with steep slopes with less than 30 % good for construction with out much destruction to the ecology of the area. The master plan identified the area for building and proposal consists of a policy of least intervention yet creating a close-knit academic community. A peripheral road along the contour provide for the only vehicular movement inside with adequate parking lots. The academic and other building are proposed along this road creating large central courts, identified as science court, food and interaction court and an art court, reachable within 10to 15 minutes by walk through meandering pathways keeping cars and two wheelers at the periphery. The construction will be mostly two storey eco-friendly buildings with out disturbing the existing flora and rock out crops and landscape features. An earthen dam will impound available water for rain harvesting for use, recycle and recharge. The site consists of 75 acres and 225 acres on either side of a highway inside a reserve forest about 20 km from Tumkur town where a regional university campus is to be established. Only 75 acres would be developed first , the other side reserved for future and for bio reserve experiments. The area is rocky and hilly with steep slopes with less than 30 % good for construction with out much destruction to the ecology of the area. This small school is on the drawing board. We are trying create a homely environment with a central open to sky green court with seating steps and each class room opening to a green space the children to do the planting and growing. The two storied building will have similar exterior spaces on the first floor as well. The academi tries to limit the size to a manageable school size and have stress on quality rather than quantity.